Vegan Spelt Fig Rolls Topped With Chocolate Icing! As many of you know, we have a walled city garden. We have had an abundance of fresh figs from our fig tree. I picked many of them yesterday & also today, so I needed to use them up. Unlike all of you, I don’t like to eat them fresh. I only love them baked, cooked into a lovely porridge, put into a lovely crumble or jammed! Ha! 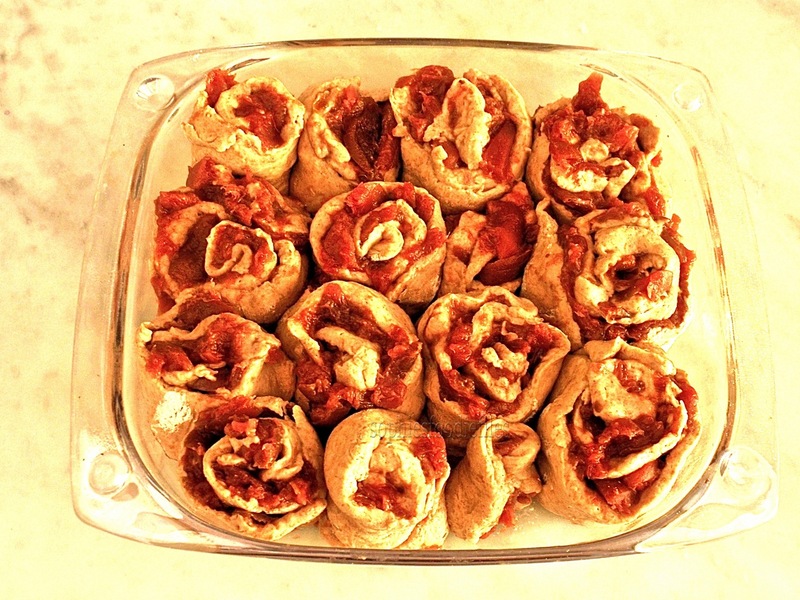 So, I took my earlier recipe of my vegan healthy cinnamon rolls & adapted it to my needs & changed the yummy filling too. 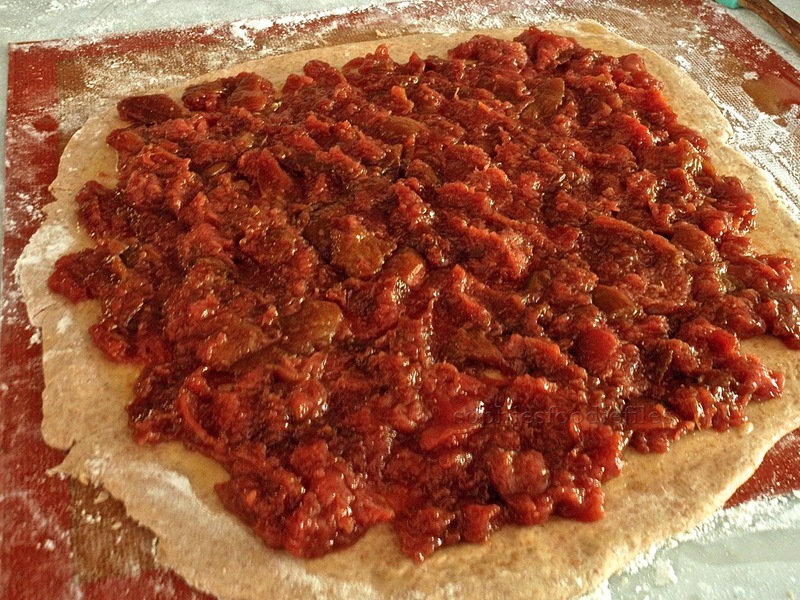 I also used melted vegan butter to stick the fig jam to the risen dough. Let’s see a tasty beauty, ready to devoured, while still warm! And a close-shot here from the set chocolate topping! These tasty beauties make an ideal FOOD GIFT, ooh yes! 🙂 MMM! 70 gr melted vegan butter, I used only half of it. 1/3 cup (52 gr) raw cashews, soaked for at least 4 hours into clean water. Rinsed & drained well. First, I preheated my oven to 200°C (400 F) for 10 minutes & then turned the oven off. In here, I will place my dough bowl in here, covered with a clean kitchen towel, to let the dough rise until it doubles in size! It took me 2 hours & 45 minutes. This will be the 1st rise! In a large bowl, combine 2 flours. Add dry yeast & mix well with a spoon. Scatter your salt all around the sides of the bowl & mix it all in. In another smaller bowl, combine the lukewarm water with the coconut sugar. Mix well with a small whisk. Now, add sugar-water mix to the other bowl & mix well with a spoon. 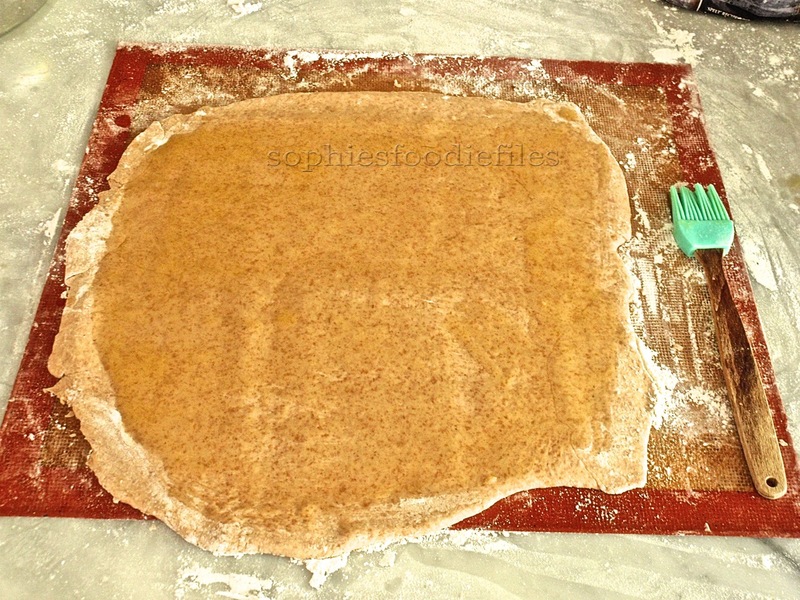 Place dough onto a Silpat or your kitchen counter that you have floured a bit. I floured my hands a bit too, to prevent that the dough sticks. Knead the dough for a few minutes, like you always do. Pull & stretch the dough, over & over again. You need to do this to release the gluten! Add oil & knead for about 1 minute or so. I oiled a bowl & placed the oiled dough into it. I placed a clean towel over the top of the bowl & placed the bowl inside the warm oven until it doubled in size. Oil added & shaped into a ball in an oiled bow. While the dough is rising, for the 1st time, make your vanilla fig jam. It is the same process & same jam recipe as my previous post! But I will make it & write it here again. Place 4 ingredients into a fitted cooking pot & bring to the boil, stirring often. When the figs begin to boil, with help of a wooden spoon, break down the figs & their skin, to release the pectin in the figs. Stir often to prevent burning of the agave. Lower the heat if you need to. Your figs will start to break down further & further, keep on stirring! After 20-25 minutes, your jam is darker in colour, the figs have been broken down & the jam tastes amazing! Now, your jam is ready. I took a masher & mashed my cooked broken down figs a bit more because I didn’t want to end up with big pieces in my dough. When your dough has risen well, it took my dough about 2 hour + 45 minutes to rise. Take it out of the bowl & scatter some white spelt flour onto your kitchen counter. Knead it for about 2 minutes. Roll it out into a rectangle shape. The thickness preferred is about 1 cm thick. This is easy to do with a rolling-pin. 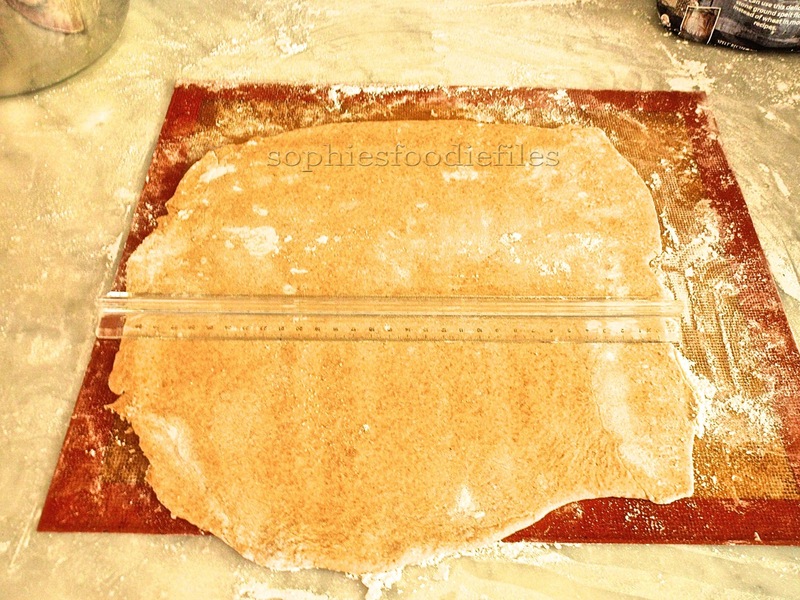 Flour your rolling-pin too to prevent sticking to the dough! First, you roll it out into the 4 directions. This means to above, to down, to the left & to the right. 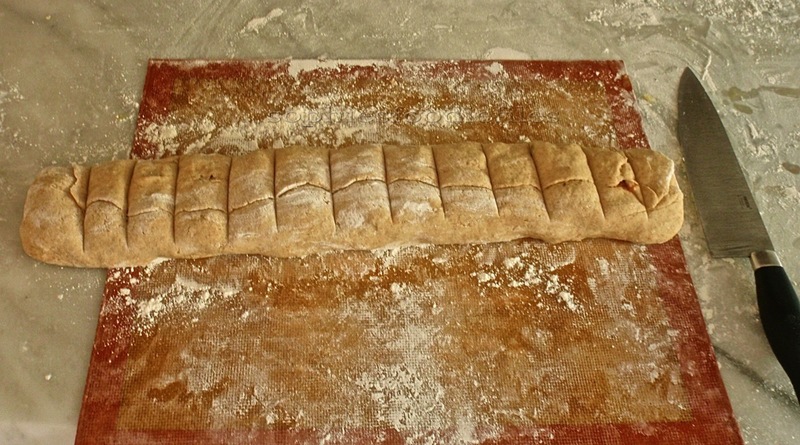 Then, you fold your 4 sides into the middle of the dough & re-roll it all again,…you end up with a rectangular shape! My shape was 31 cm x 30 cm! First, brush the melted vegan butter all over the surface of the dough, but leave all around the corner sides 1 cm free! I still had 1/3 leftover. I brushed it on with a small brush. 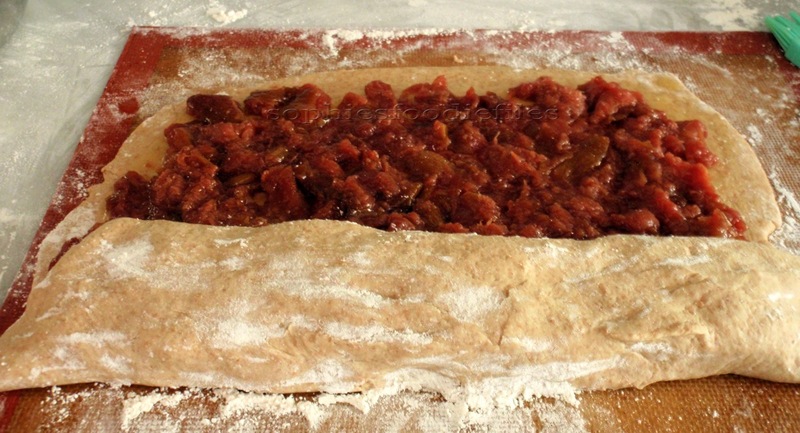 Then, spread the filling aka cooled fig jam, evenly out over the base of your rectangular shaped dough, but leave all around the corner sides 1 cm free! This is best to do with the back of a spoon or with your clean hands. You can roll the dough into the final log, into a sausage shape, trying once again to be as precise as possible so that you will get nice and even final rolls. Scatter some white spelt flour onto the surface to prevent the sticking the dough to the Silpat!!! To close the log, on the edges, brush a little of the melted vegan butter on the clean piece of dough that you didn’t brush. Finish rolling the log to complete the process. See that every roll has enough filling in it & is precisely all evenly thick. You could change that with your hands. See that the ends also have filling in them & fold them to the inside to close the 2 edges. With help of a big knife, see that you make top cuts, that are all equally sized. Cut for 1/3 into your long roll to make 13-15 equal sized rolls. It helps if you do it like this: Then, I rerolled every piece because I am not good in folding them tightly & neat. I carefully opened a roll & rerolled them firmly & tightly packed with my hand. I also did this with the other cut up rolls. I placed them all into a fitted oiled baking dish, side by side, with the cut opening up! Cover them with a clean kitchen towel & leave them to rise for another 30 minutes into a warm place. I reheated my oven to 200°C (400 F) for 5 minutes. I turned oven off & in went the cinnamon rolls. I left them to rise for 30 minutes. This is the 2nd rise. After 45 minutes, your rolls will have swollen & risen well. All of the dough rolls now stick together,…that is what you want! Now, take them out of the cooled oven & preheat your oven to 200°C (400 F) for 10 minutes. Place them into the hot oven for about 15 minutes or until browned & cooked through. Test with a small pin. Mine were ready & browned. While your rolls are baking, make your chocolate icing! This is a cashew chocolate icing to be precise! 🙂 Take your Vitamix & blend soaked cashews, cashew milk & maple syrup together using the tamper. See that you end up with every cashew totally blended! At the same time, take a small cooking pot & fill it with 2/3 water. Place a fitted metallic bowl onto it. Place your vegan dark mini chocolate chips in it. Bring to the boil & when boiling, lower your heat. See that the water doesn’t touch the bowl on it. This is called au-bain-marie. Stir with a wooden spoon until the chocolate is all melted! Turn heat off. Now, off the heat, add blended cashew mix into the melted chocolate. Mix well with a small whisk. Take your fig rolls out of the oven & place onto your kitchen counter. With help of a spoon, drizzle that lovely chocolate icing all over over the top of the rolls, as much or as little as you want! I still had 1/2 of the chocolate icing over!! Put them into the turned of warm oven for about 20 minutes. Leave them to get a bit less hot & indulge yourself,…They came just out perfect! The inside is all yummy with the vanilla fig jam & not too sweet & the outside is bread-like & the topping is just to die for,…very sticky & chocolately! Waw! They are also very tasty eaten cold the next day as a nice breakfast beacause they are all so goewie!!!! MMMMM,…When they are completely cold, store them into the fridge. Take them out of the fridge 15 minutes before eating!!! nom nom,..I assure you that you want 2 pieces! Ooh yay! Enjoy, sweeties! xxxx You can also find this tasty recipe HERE ON INSTRUCTABLES! Vegan Spelt Cinnamon rolls topped with cashew caramel frosting! 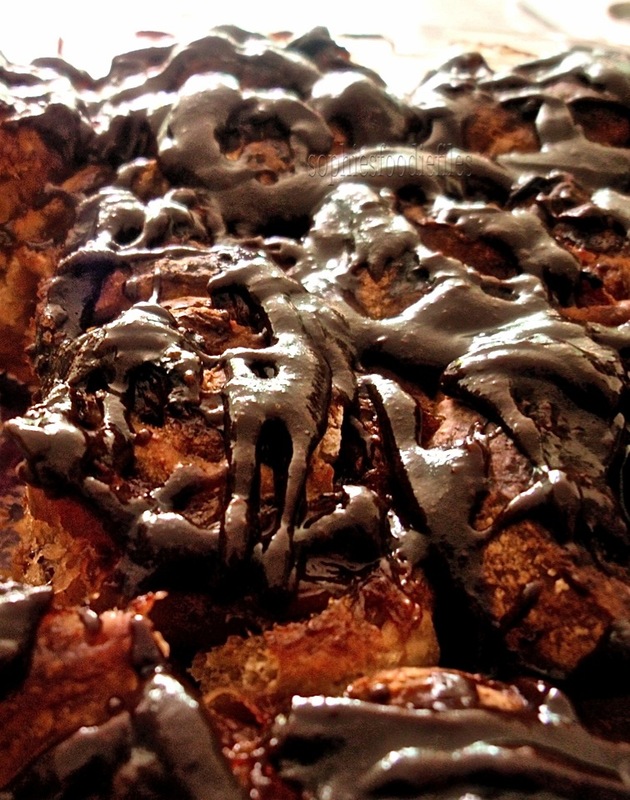 Vegan Cinnamon Nut Rolls topped with sticky icing! Previous Post Healthy 4 Ingredient Vanilla Fig Jam! Next Post Hi,…It’s me again! :) + Vegan Spelt Pumpkin Cake! These look super yum!! Love that homegrown fig filling. Amazing!!! I love figs, and this dessert sounds delicious and it’s a big plus that it’s healthful as well. Great recipe. Oh my gosh, these look AMAZING! I bet you could sell them! Mmmmm! Look yummy! thanks Sophie for sharing! It is super tasty! I assure you! It is very addictive! So glad glad to hear it Sophie! You eat so well and take care of yourself– thankful you’re doing better! Too late now as I have eaten or given away most of my fresh figs but will save jam recipe for next year. Thanks for sharing. Thanks so much! Enjoy them! 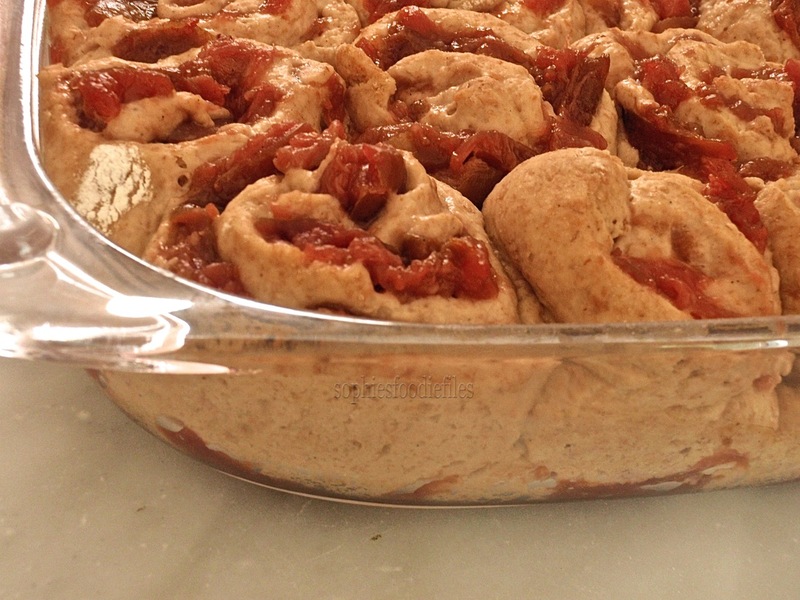 Hi Sophie– I love love this recipe– but when I check back on your blog, it’s still on top! Hope you are OK, everything is going well with you. Miss you posts. Take care dear around the world friend. hugs. My thyroid medication is off again. It was good for 16 days & I am off blogging at the moment. I also am learning to play the piano & I am gardening a lot too, lately.